Pilates for Men – Guys get in the Groove! One on One, Duet and Group Pilates Sessions Available. Call 914-967-9622. The lines of demarcation are clear; women do yoga, barre Pilates, and softer kinds of exercise while men lift weight and wrestle to appear manly. Right? Wrong! More and more men are finding out that core strengthening pilates exercises can complement any other exercise program they may come across. Pilates is far from a girly activity; the founder of the original program was a man, and many of the early adopters of his exercise routines were recovering war veterans. Ballet dancers, both male and female, quickly adopted Pilates and Barre Pilates remains one of the most popular variations to this day. However, somehow Plates got pigeonholed as a “woman’s thing” and men, at least in the US, didn’t really think about it until recently. Thankfully, more and more studios are holding classes for men, and more and more men are even becoming instructors, making Pilates a manly endeavor once more. Why should guys do Pilates? Here are just a few of the reasons. Pilates strengthens the core, which is often ignored in many male oriented gyms. Attention is paid to arms, legs and creating a “six pack”, but the real core conditioning is left out. Pilates can increase core strength and make all the other workouts easier! Pilates increases flexibility. Athletes in all sorts of specialties can benefit from extra flexibility, including gymnasts, hockey skaters, baseball, basketball, football and soccer players. 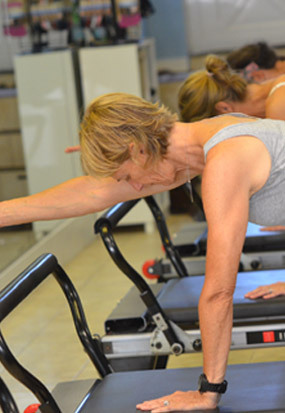 Pilates is the perfect way to regain strength and build back abilities after an injury. This was the original point of Pilates, after all! Many hospitals are now putting in Pilates equipment in their rehabilitation centers to help patients of all ages and genders recover balance, range of motion, and strength. Men in activities where grace, balance and agility are paired with strength can also benefit. Ballet Dancers, gymnasts, figure skaters and more can benefit from a Barre Pilates workout. Guys should definitely get in the groove – Pilates is no workout for the fainthearted and men can stay manly while getting the core workout of their lifetime. Sign up for just one session, and find out how much of a challenge it really is – we guarantee you’ll be back for more, if only to prove you can hold your own!